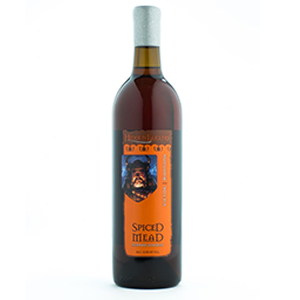 Spiced Mead has a special place in the history of many cultures. The coveted recipes were carefully guarded by vintners who were members of the clergy. Our winemaker has taken this festive favorite and created a delightfully modern version of spiced mead that can be heated with a stick of cinnamon, poured over ice, with a sprig of mint, or enjoyed by itself. This spiced mead complements turkey or pork and is best served slightly chilled. This is one of those meads you need for the holiday season! It has a rich spicy flavor that will definitely go with your Thanksgiving turkey, or become an essential ingredient for wassail. For me, I preferred it in wassail, pumpkin soup, or as a hot drink but not as a chilled beverage. I felt that the spices made it very rich and overpowering. I still think its a good mead and other people in my family enjoy it more than I did. Definitely give it a try! I tried mead of the spiced variety for the first time with this one to mix it up and found it to be very pleasant. I enjoyed it thoroughly. A wonderful mead that made for great evenings with me and my fiance. The spiced aroma was mouth watering alone to say the least! Even my friends who’ve never had mead before loved this bottle (you can be sure i made them try my whole selection.) All in all a wonderful purchase and I’ve already ordered more for this winter!